Summer isn't officially here, but since we've had a few hot (almost muggy actually!) days I've made both versions of this salad in the last week. It's something that I sorta-kinda made up based on flavors that I love-- garlic, basil, pesto and balsamic vinegar. It's super easy to put together and The Mister and the kiddos love it. substitute the Pesto with a drizzle of Balsamic Vinegar. For a rich flavor, invest in a good Balsamic Vinegar (preferably an Aceto Balsamico Tradizionale di Modena) which has a rich flavor and isn't as acidic as other vinegars. It really makes a difference and a little goes a long way. Cook soba according to package directions (around 5 minutes). 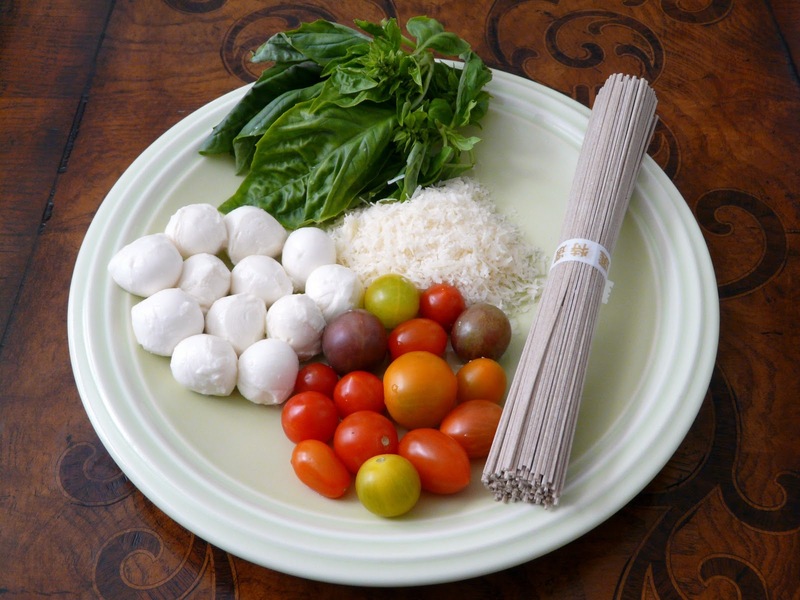 Cut up mozzarella, basil and tomatoes. Grate Parmesan-Reggiano cheese. After noodles are cooked, rinse in cool water and drain. Place noodles in a large bowl and cut into bite size pieces (I use kitchen shears). Add the mozzarella, basil, tomatoes and pesto sauce **or if you're doing caprese-style, omit pesto and drizzle a little balsamic vinegar instead. Toss, then lightly drizzle olive oil and add a little garlic salt. Toss and add more olive oil, garlic salt and pesto/vinegar to taste. Sprinkle parmesan on top and serve. To make this a full meal, serve on a bed of chopped lettuce with additional olive oil and balsamic vinegar. Sometimes I throw in feta too. Extra good with a nice, crusty bread.